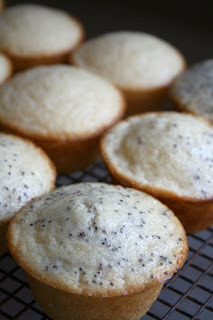 I started with the Lemon Poppy Seed Muffins. 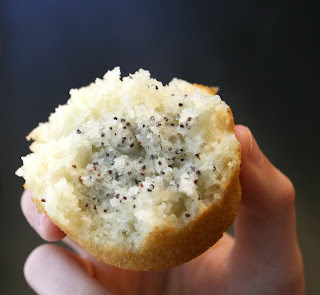 My oldest one asked that I not put poppy seeds in his (texture issues), so I made the batter and then added the poppy seeds to some of them (that should explain the poppy seeds only being in the center of this one). These were so light and fluffy with a nice lemony tang. I huge hit here! Next I made the Old-Fashioned Chelsea Waffles. I am not going to lie to you...these were the best waffles I have ever had! Ok, so I haven't had that many waffles in my lifetime, but still...these were so good! I loved the addition of cornmeal to make these nice and crispy. 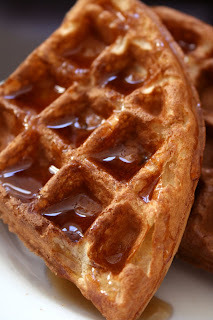 Most waffles I have had in the past have not had this crispness, so I was so happy when these held up to the toppings. As suggested in the book, I made the Brown Sugar Peach Coulis with some of my fresh South Carolina peaches and poured some on top of my waffle. 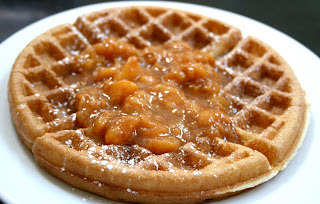 Although not expecially photogenic, his sauce is the perfect accompaniment for these waffles! I will also mention that since the waffles were eaten so quickly and there was sauce left over...this stuff is amazing in oatmeal! 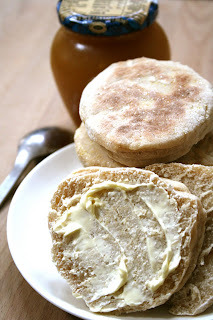 Next up, were the English Muffins. 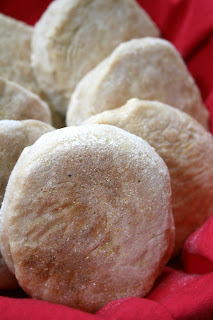 I have the hardest time finding English Muffins at the store that don't have dairy in them. So, it has been awhile since I have gotten the opportunity to enjoy them! Again, this recipe was without fail! I thought English Muffins would have been more difficult to make. The recipe was very easy to follow, as were all of the recipes I made from the book. I loved it smeared with EarthBalance and ginger preserves! The rest of the family enjoyed egg and cheese sandwiches with these little babies! Now, we are a bagel loving family!!! So, I thought I would try out the Bagel recipe. This one, I was a little confused by. 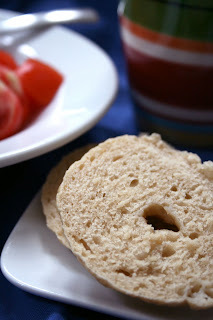 They were delicious, but (for me) they made 12 mini bagels. I followed the recipe exactly and I know yeast breads can be a bit tricky at times, but these came out a little too small for what I was looking for. The book refers to these as being like a NYC bagel so I thought it would make nice big fat bagels...that is not what I got. Delicious, but small. 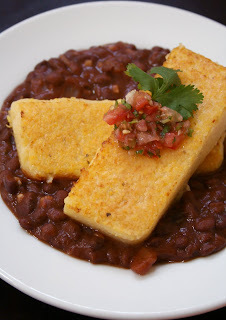 Last (for now), but not least, is the Polenta Rancheros! I prepared mine a little differently because the book gives you a suggestion for the "leftover" polenta that I wanted to try for my version of the recipe. The recipes uses soft polenta with this dish to be reminisent of a soft egg which is closer to the tradition rancheros dish. I am happy I went with the alternate version though! The polenta was nice and crispy on the outside and so soft and creamy on the inside! I ate way more of this dish than I should have! My youngest one gave me major compliments on this dish...I gave Vegan Brunch the credit though. I am a firm believer in credit where credit is due! I have to say that I kept putting off reviewing this book because I kept finding recipes that I wanted to try. Isa starts off by giving a list, with descriptions, of pantry items to have on hand. She also gives you ideas for how to set up a great brunch. Then the book goes into the recipes that range from tofu scrambles, homemade sausages, fresh baked goods and then to drinks. 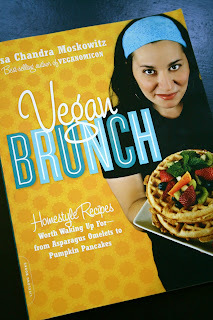 So, if you love breakfast food and are tired of not being able to enjoy diner style food out, then Vegan Brunch would be a great addition to your kitchen! The polenta dish has been on my to-make this for wayyy too long. I must get the ingredients soon! Hey, what's wrong with our fine Georgia peaches! HUH! I see how you are now, taking your business out of state. Thanks for supporting our local economy! It's like you just pooped on Sonny's front lawn.